Brighton midfielder Andrew Crofts is expected to miss the rest of the season after suffering a second serious knee injury in the space of 10 months. The 30-year-old sustained a partial tear to his anterior cruciate ligament and a tear to the meniscus in the 1-1 draw with Watford on Saturday. The Wales international had successful surgery on the injury on Wednesday and is now recovering in hospital. "We are all devastated for Crofty," Brighton manager Sami Hyypia said. Crofts, who has made eight appearances for the Seagulls this season, suffered a similar injury to the same knee in January. A ruptured cruciate ligament in his right knee ruled him out of the remainder of the 2013-14 campaign, and he only returned to first-team action in August. 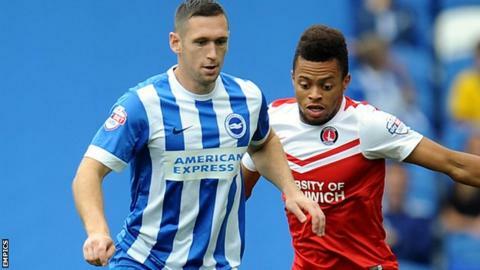 The former Gillingham and Norwich man recently extended his contract at the Amex Stadium until the summer of 2016. "He is an important member of our squad and worked incredibly hard to get back to full fitness after last season's knee injury," Hyypia added. "Crofty is a very strong character and he will continue to receive the best possible care and treatment from our medical staff throughout his rehabilitation. "In the meantime, everyone at the club wishes Crofty well for a full and speedy recovery."